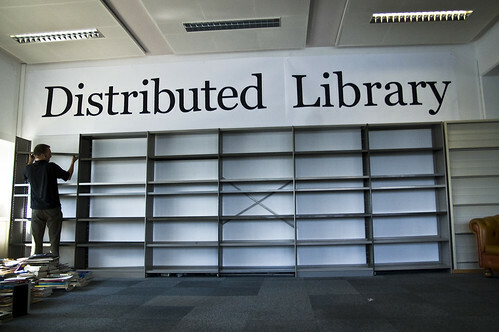 A library filled with books and media objects waiting to be taken care of. Mediamatic has been carefully documenting their collection of books, magazines, VHS tapes, Betamax tapes, CD-ROMs and a wide variety of other media objects in Filemaker. The first part of the project consisted of exporting this Filemaker database to a .cvs file that could be “cleansed” before importing it into Mediamatic’s anyMeta system. The cleaning of data is a meticulous task for any (un)certified Data Care Specialist. Unfortunately the original Filemaker file had all the authors in one single field without a consistent notation. I spent the first week on preparing an import file for anyMeta and working with Mediamatic on database structures and press releases. After 2500 items were imported into the database Roos and I went through the whole physical archive and moved it into the library space. We started planning and organizing the event that took place on Saturday 28th and Sunday 29th of June. 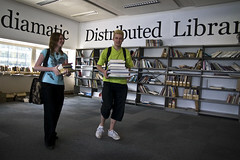 The event on Saturday started at 4 o’clock and dozens of people who had been waiting outside for the doors to open entered the library. Even though we had friends helping us register all the outgoing books the amount of people who wanted to take care of all the books was overwhelming. There were drinks and a DJ and a lot of press present to cover the bookparty. After day 1 about 70% of all the titles were gone and distributed among the members of the Mediamatic network. 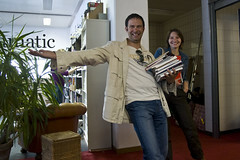 On the second day there were still dozens of people taking up to thirty books home! It was less busy which gave us the opportunity to personally help people to enter stories on the books and take pictures for the website. One of the rules of the Mediamatic Distributed Library is that you will write down your motivation for taking care of this particular book and enter a picture into the system. A typical page will then look like this entry on the book Jargon Watch. The idea is to extend the information on the media objects and to build a social network around them using the existing Mediamatic network. The Stedelijk Museum is going to take care of all the items that have not found a new caretaker this weekend and is going to distribute a part of the collection among other cultural institutions and libraries. 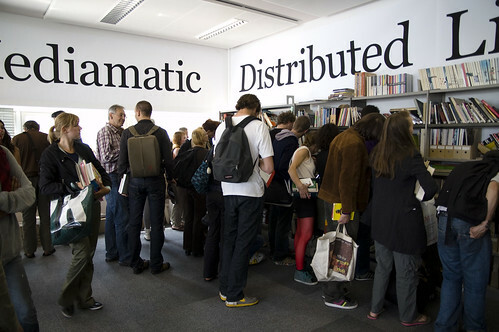 Mediamatic is thinking about organizing a follow-up event to meet your fellow booklovers, caretakers to provide a platform where you can exchange your books or bring new books for the distributed library. 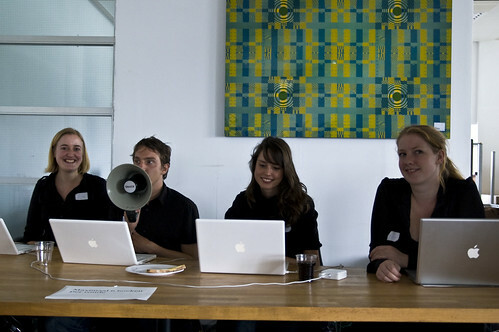 Keep your eye on the Mediamatic website for more information. 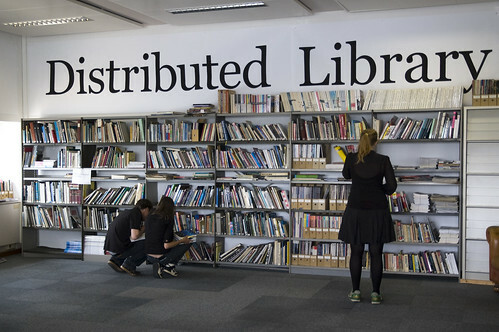 I love the idea of the distributed library. Unfortunately I wasn’t able to be there, but this post almost makes up for it. Thanks Anne! Thanks! I will keep you updated if there is going to be a follow-up event.